International - Trade mech options with other countries in Carnage Heart! Arcade - Battle in the air or on the ground in Virtual On Cyber Troopers! PlayStation - Mortal Kombat II and the PS...it's an extremely deadly kombination! Saturn - Own and race a champion racehorse with Winning Post! He Might Be A Friendly Ghost, But Casper The Game Can Be Frightening! - All casper wants is to have a few friends, however his uncles - Fatso, Stinky and Stretch - are making his unlife difficult. It's up to you to help Casper while trying to stop his grotesque relatives. For your aid, we have devoted 12 pages detailing all the tiny intricacies in this game. Of course, for those of you who would like just a hint, take a look at the maps and read only the bold text. however, impatient gamers might want to read the entire guide to help themselves out during a difficult jam and to locate all the cool items, too! Sharks, Snakes, Spiders and Dogs are Just the Beginning of Your Adventure! - Resident Evil is a real nightmare and not because of its huge levels either. In this game, you'll encounter poisonous snakes, bloodthirsty zombies, crazed dogs and even a shark swimming in a flooded room! 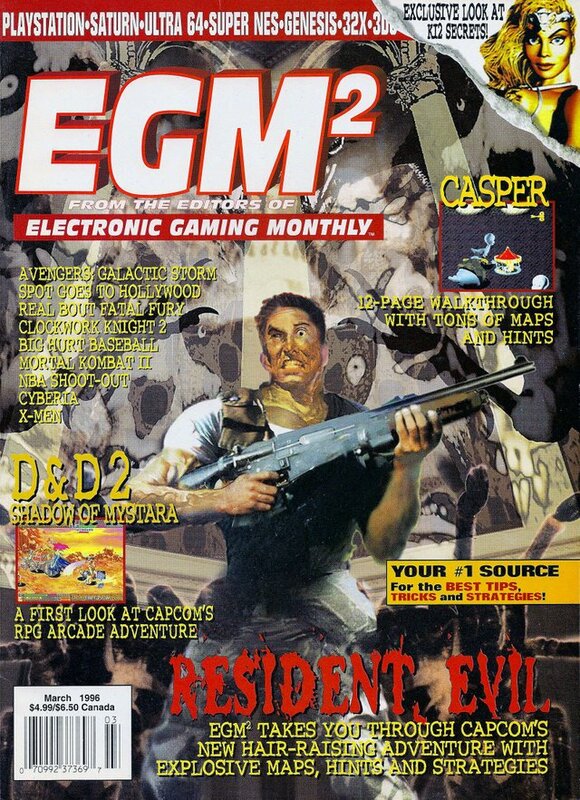 However if you have EGM2's strategy guide, there is nothing to fear. Inside this eight-pager, there are maps showing you where hints are located, as well as a few survival tips. But don't think we gave everything away. Only the bare essentials to getting out of the mansion are provided...the rest is up to you! Clockwork Knight 2's Spectacular 3-D Graphics Will Wow Gamers! - If you thought Clockwork Knight had stunning graphics, the sequel will blow you away! But don't let the awesome 3-D graphics fool you into believing that the Difficulty Level is low. You'll need EGM's eight-page, info-packed strategy guide to help you through this gigantic game. Everything can be used to stop the bad guys, even trees can be picked up and thrown at the enemies. Also, the secret warps are aplenty in Clockwork Knight 2. Don't forget to check out the awesome tricks that will help you out of dangerous areas. Check out some of my other recent retrogaming posts!